Thank you to Everyone who Supported our Fundraiser! 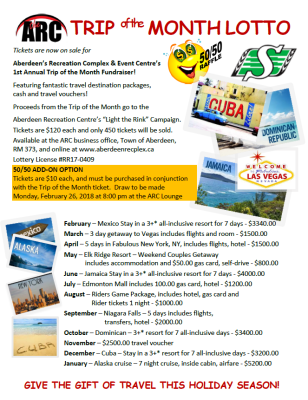 1st Annual Trip of the Month Fundraiser! 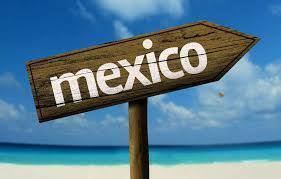 Featuring fantastic travel destination packages, cash and travel vouchers! Proceeds from the Trip of the Month went to the Aberdeen Recreation Centre’s “Light the Rink” Campaign. Tickets were$120 each and we sold 300 out of 450. The 50/50 was worth $2820.00! The LEDs have been installed in the Hockey Arena! Thank you Everyone!!! 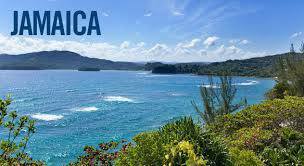 Stay tuned for Trip Lotto 2019! Monthly draw dates are the last Monday of the Month in the ARC Lounge at 8 PM. Join us for themed parties with drink and food specials! - 50/50 add-on tickets must be ordered in conjunction with regular draw ticket. 50/50s may not be purchased separately. Each draw will select one (1) winner at random. All tickets are entered in ALL 12 draws. Prizes are transferable, but only prior to booking with “Go Travel”. 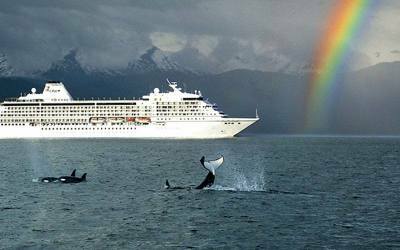 All packages are tentative and are subject to change due to availability at time of booking. All packages are based on double occupancy. Any changes to listed prize will be at winner’s expense. Prize packages priced at low season. Destinations shown should be used as a guideline only, as prices may vary pending on when you want to travel. Trips must be booked with “Go Travel” within 4 months of draw date and utilized within 1(one) year of draw date. No optional insurance or surcharges are included with the prizes. 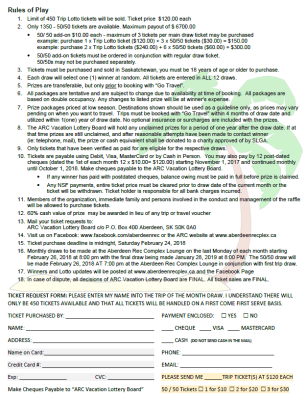 The ARC Vacation Lottery Board will hold any unclaimed prizes for a period of one year after the draw date. If at that time prizes are still unclaimed, and after reasonable attempts have been made to contact winner (ie: telephone, mail), the prize or cash equivalent shall be donated to a charity approved of by SLGA. Tickets are payable using Debit, Visa, MasterCard or by Cash in Person. You may also pay by 12 post-dated cheques (dated the 1st of each month 12 x $10.00= $120.00) starting November 1, 2017 and continued monthly until October 1, 2018. Make cheques payable to the ARC Vacation Lottery Board. - Any NSF payments, entire ticket price must be cleared prior to draw date of the current month or the ticket will be withdrawn. Ticket holder is responsible for all bank charges incurred. Members of the organization, immediate family and persons involved in the conduct and management of the raffle will be allowed to purchase tickets and win prizes. 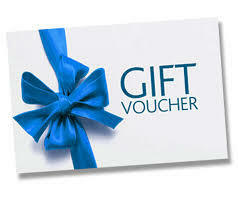 60% cash value of prize may be awarded in lieu of any trip or travel voucher. ARC Vacation Lottery Board c/o P.O. Box 400 Aberdeen, SK S0K 0A0. Ticket purchase deadline is midnight, Saturday February 24, 2018. Monthly draws to be made at the Aberdeen Rec Complex Lounge on the last Monday of each month starting February 26, 2018 at 8:00 pm with the final draw being made January 28, 2019 at 8:00 PM. 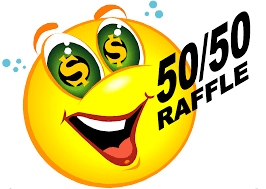 The 50/50 draw will be made February 26, 2018 AT 7:00 pm at the Aberdeen Rec Complex Lounge in conjunction with first trip draw. Winners and Lotto updates will be posted at www.aberdeenrecplex.ca and the Facebook Page. In case of dispute, all decisions of ARC Vacation Lottery Board are FINAL. All ticket sales are FINAL.